You can only treat what you can see! Latest generation Endodontis treatments represent the starting point in assuring the success of long tern tooth biological functioning and in patient’s lack of pain. High tech equipments add to the endodont specialist’s in depth medical knowledge. Currently, top world dentists agree microscope endodontic treatments maximize long term patient’s benefits. Various global developed studies showed that the technique used in under microscope treatment is superior to that used in traditional treatments. Therapy ergonomics is improved both for the dentist and the patient. City Dent, true to it’s creed to offer the best dental technology to it’s patients, purchased the newest dental microscope model from Zeiss, Pico Mora. This device magnifies the work area up to 20 times, allowing the endodontics specialist to treat the most complex and complicated dental situations. 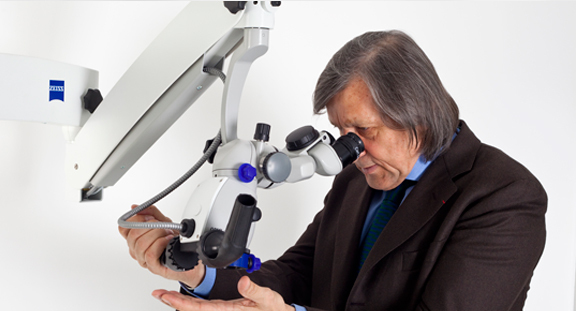 Solving specialty or unique treatment situations in a more efficient and accurate way is possible due to the tooth image magnification and work place coaxial lighting. Dentists will be able to observe in detail the root canal, it’s possible problems and successfully treat them.